Outdoor kitchens come in many shapes and sizes! They have become our highest demand outdoor elements over the past 10 years. Minnesotans have a very small window of time each year to spend outdoors, so being able to cook and entertain outside is essential! This charming “cottage feeling” backyard has a beautiful outdoor kitchen with mortared flagstone and bluestone countertop. 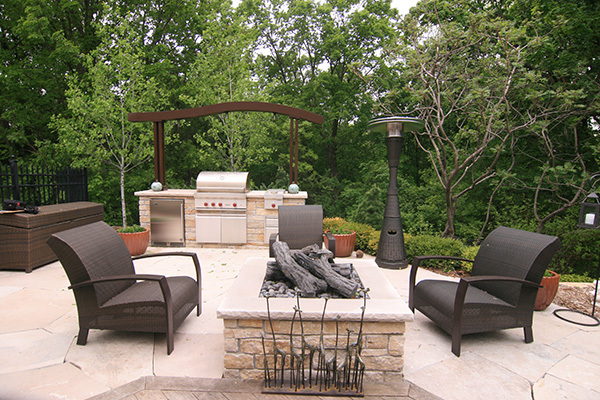 There is a lot to think about when you start designing your outdoor kitchen, especially in Minnesota! Are you going to want to use it more than just the summer months? What type of stone or product suits the style of your home; so it ties in all of the design elements together? Do you plan to use this space to create more than food, what types of appliance will you need? How large is your space – do you have any space constraints? Will you need to incorporate a bar for guest to sit at? Let’s dive into all these questions a little bit more! This home in St. Paul, MN lacked an entertaining space. 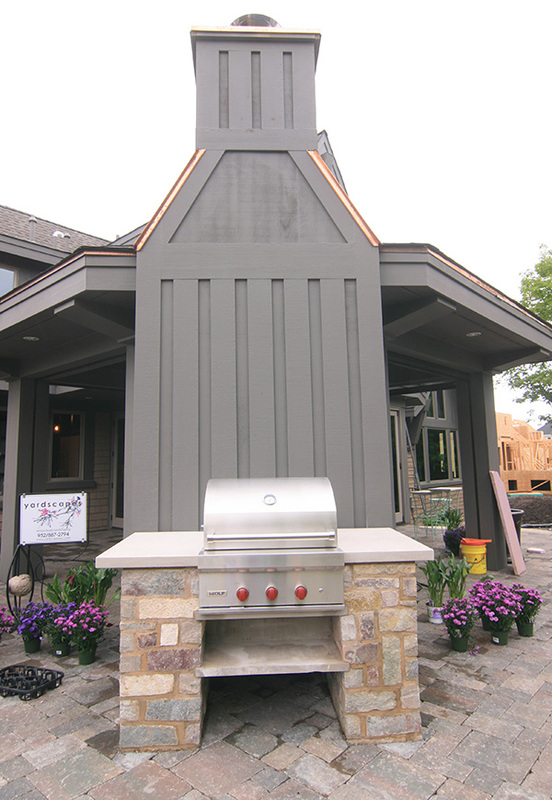 Yardscapes was able to create it all with a large outdoor kitchen, pizza oven, gas fireplace, and gas fire pit. Are you going to want to use it more than just the summer months? 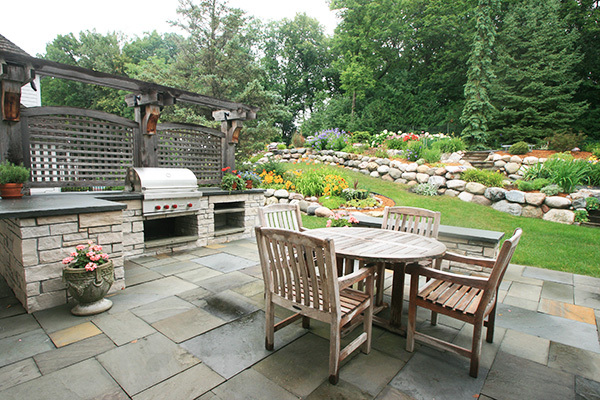 If so, then you will want to think about placement of your outdoor kitchen. Most likely you will want it closer to an access door so you can run out in freezing temperatures. You probably already shovel your front walkway and driveway and you probably don’t want to throw your back out shoveling to get to the grill too! If you don’t tend to grill in the winter (why not?) then placing it close to the house may not be as important but do keep in mind that you will be carrying a bazillion things out in the summer to entertain. 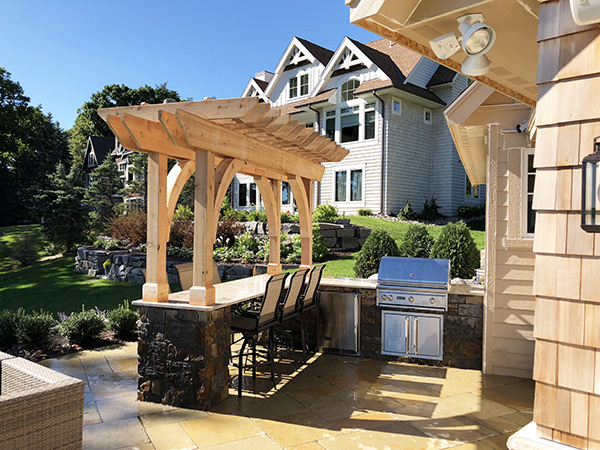 I’d highly recommend hiring someone that is knowledgeable in constructing outdoor kitchens; you will run into city codes and building codes that will need to be followed to make your outdoor kitchen safe. 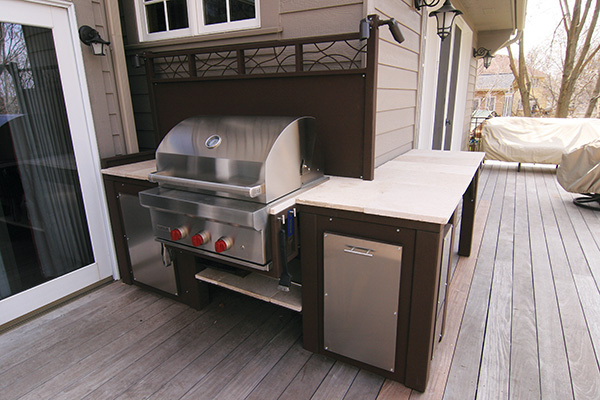 This custom metal outdoor kitchen was constructed on a raised deck outside their kitchen door for easy access and it is aesthetically pleasing as well. What type of stone or product suits the style of your home, so it ties all the design elements together? 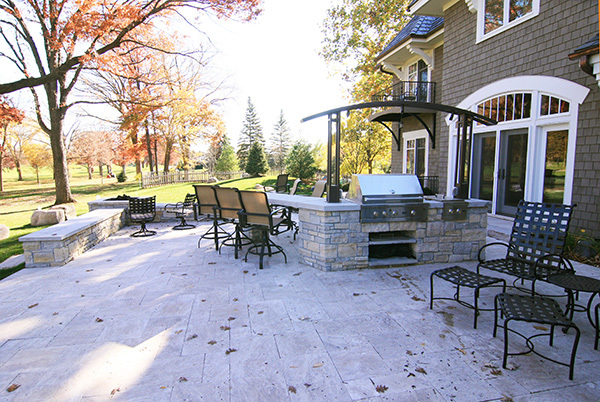 We like to mix it up with materials used on outdoor kitchens, but we typically use a natural stone mortared over block footings with combinations of custom metal legs or details to make it unique to your property. Outdoor kitchens can get quite large in scale, depending on what your intended use is, so we really try to blend the outdoor kitchen into the architecture of the home. 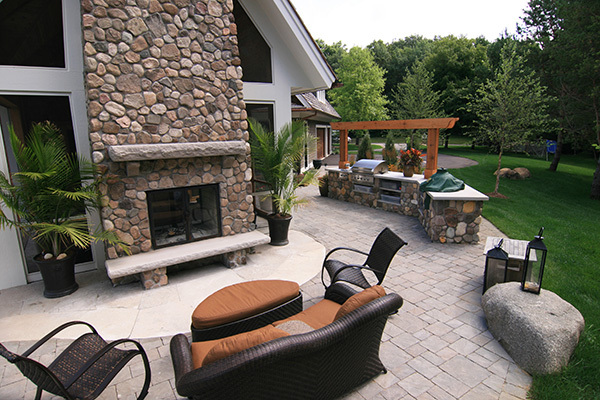 This beautiful river rock fireplace and outdoor kitchen are the perfect combination for this outdoor entertaining space. Do you plan to use this space to create more than food? What types of appliances will you need? There are so many great appliances for outdoor use these days. Even if you only plan on grilling in your outdoor kitchen, you still must decide on your fuel source: gas, charcoal or both. If gas, then a gas line usually needs to be ran, unless you plan to change out propane tanks. I would suggest running a gas line for ease of use if you can find it within your budget. Other clients may want to use it more for entertaining and would like to incorporate refrigerators, freezers, or ice makers. Both woodfire and gas pizza ovens have become popular as well. My mouth is water talking about an outdoor pizza party! What about shelving and doors to keep utensils in? It’s as custom as your indoor kitchen! Now let’s start designing! The dark flagstone mortared on to this outdoor kitchen is a perfect balance against the light colored house and travertine patio surface. The contrast makes it pop. How large is your space? Do you have any space constraints? 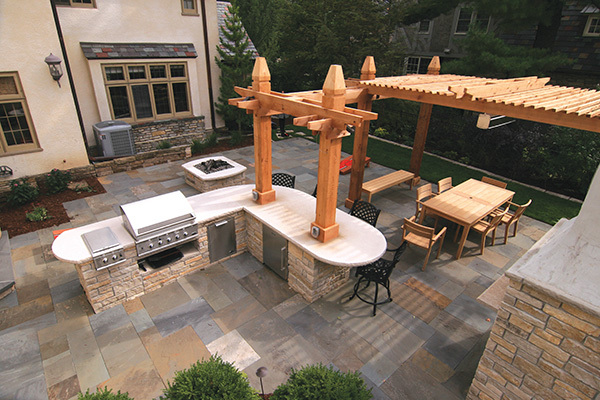 We come across many clients that really want an outdoor kitchen but think their space is too small. That’s why you hire a professional that knows landscape design and construction. Most times we can find a space or the right tools to tuck one in somewhere. Whether your space is big or small, we will find a way! This is the entertaining patio! It was large enough to place the outdoor kitchen in the middle of the action with a bar attached. We also created a custom metal arbor for detail and lighting for nighttime use. Will you need to incorporate a bar for guests to sit at? Depending on the space you have and if it will fit into the flow and function of the space, it’s nice to have a space for guests to sit while you are grilling or cooking up your masterpiece. As you will see in some of the designs, we have created bar extensions or islands using metal for support. It helps make it feel more light and airy. This artistic backyard already had great character. 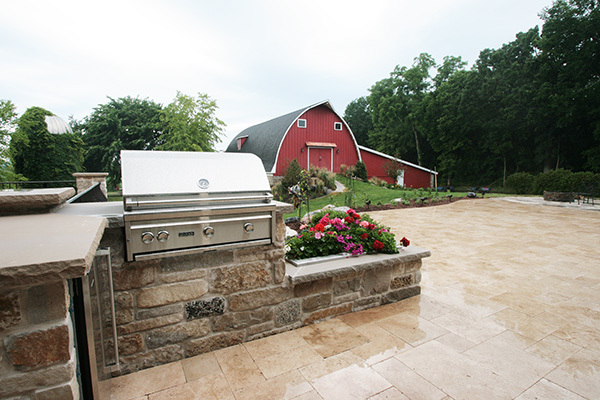 Yardscapes added a small outdoor kitchen with a grill and refrigerator for entertaining by the firepit. This small grill stand fits perfectly against the dramatic blue of the house and ready to use for entertaining. 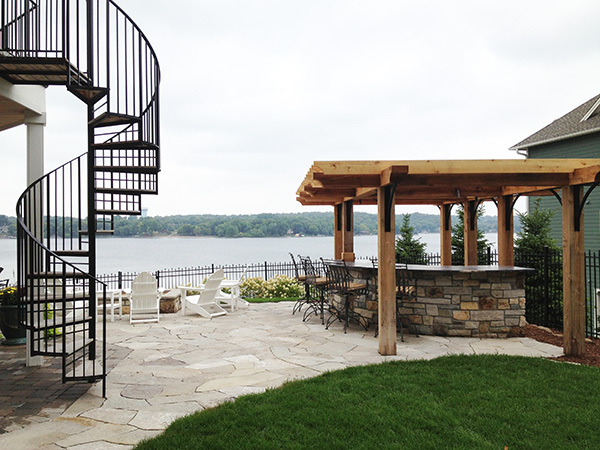 What a view from this bar and outdoor kitchen overlooking Prior Lake! It’s hard to believe this is a new construction “Irish cottage on Lake Minnetonka, Minnesota”. The curved outdoor kitchen and bench feel like they have been like that forever. One of my favorite Yardscapes designs! This renovated farmstead is so quaint and beautiful. The detail of adding a planting bed to the outdoor kitchen is perfect! This entry was posted in Accessories, Bluestone, Entertaining, Finished Projects, Fire Pit, Fireplaces, Metal Work, Mortarted Stone, Outdoor Kitchen, Pavers, Pizza Oven, remodel, Stone work and tagged entertaining, metal, outdoor kitchen, patio. Bookmark the permalink.